I'm breaking my December blog silence with a report of a grand event. For most, the climax of December is the 25th, and rightly so. But this year it almost feels like yesterday was the climax. For months we have been anticipating the return of our 'a-wayward son' Yesterday afternoon Calvin arrived back in Seattle. A small welcoming committee gathered to greet him at the terminal. However, the one surprised was not Calvin but the welcoming crowd. 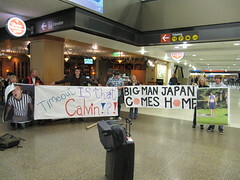 Unbeknown to the gathering welcomers, Calvin had taken an earlier flight from Vancouver. He patiently waited in the shadows as friends gathered with posters and anticipation. As Esther and I joined the group, Calvin surprised us from behind, fifteen minutes before his plane was to arrive. He helped unroll his welcome home posters for the terminal to enjoy. An hour later, we were able to turn the surprise back to the traveler as Josh deLacy arrived from Michigan. The unusual poster and poem caught the curiosity of all who passed by. Josh and Calvin's friend, Alicia is never short of ideas. Calvin was craving Mexican food so four cars followed one GPS on a goose chase to a nearby Archie's Mexican Food.